I didn't catch the series when it was on television, so I was happy when I was asked to review Dancing on the Edge in my own time. I really liked this series. Being a period drama fan I found that it helped give me that fix that I don't get from Downton Abbey now it's off our screens. I found it slightly less gripping than Downton and I didn't become as attached the characters in Dancing the Edge as much, that said I did enjoy it. The acting is excellent, particularly from Chiwetel Ejiofor and Matthew Goode. I'm not going to go into the plot here - I'll leave you to read the publicity info below but there are things about the series that weren't related to the storyline or characters that I absolutely LOVED. These were the sumptuous filming locations, in particular, Fenton House and Garden which was used as the home of Mr Donaldson. It is now going on my National Trust wish list of places to visit. We will also be checking out the Bluebell Railway, they have special 'kids for a quid' days that are worth checking out to keep the cost down. Noah and Isla will love that experience! And if we ever venture to the Midlands then Ragley Hall (the home of Lady Cremone in the series) will be worth the trip; an absolutely beautiful stately home. The costumes in Dancing on the Edge are the other stars of the show - what I wouldn't do to wear some of those glittering, shimmering 1930's dresses that Pamela and Sarah wore! That period in time really was one of style and glamour if you lived in high society. And finally you couldn't fail to enjoy the music in the show, there were particular songs that were heard throughout the series that I grew to really like. I have found myself humming 'Dancing on the Moon' many a time. I'm not a massive jazz fan but this was easy on the ear and was a massive part of the storyline and the personalities in the show. Give it the old soft shoe and shake away the blues as you experience all the jazz and razzmatazz of swinging 1930s London in a brand new British drama with a twist. Experience a story of love, music and ambition first hand, set to a sensational soundtrack in the toe-tapping debut of DANCING ON THE EDGE - out on DVD on 11 March 2013, courtesy of ITV Studios Global Entertainment. With an outstanding cast line-up including; three-time Golden Globe® nominee Chiwetel Ejiofor, (Dirty Pretty Things, Children of Men) as Louis, the leader of the Louis Lester Band; Matthew Goode, (Watchmen, A Single Man) as Stanley, the ­­­­­­­music critic who looks to change the music scene of London; Golden Globe® winner John Goodman, (The Artist, The Big Lebowski) as Masterson, the richest man in the world with a dark secret; four-time Golden Globe® nominee Jacqueline Bisset, (Joan of Arc, Under the Volcano) as the reclusive and mysterious Lady Cremone and Jane Montgomery, (Black Swan, Entourage) as designer and jazz enthusiast Sarah. Stand-out performances also come from Anthony Head, (Buffy the Vampire Slayer, Merlin) as the band’s patron and backer, Donaldson; Angel Coulby, (Merlin, The Jacket) as smooth lead vocalist Jessie; Joanna Vanderham, (The Paradise, The Runaway) as Pamela, a socialite with a love for music, and finally with support from the great Mel Smith, (The Princess Bride, Hustle) as Shlesinger. Directed by Stephen Poliakoff C.B.E (The Lost Prince, Glorious 39) and reverberating with an exceptional retro score with music and lyrics by Adrian Johnston (Accused, Above Suspicion, Brideshead Revisited), DANCING ON THE EDGE is sure to put a spring in your step. In the aftermath of the Great Depression, just before the dawn of the Second World War, the UK’s capital city found itself within a time of extraordinary change. Bubbling beneath the once austere surface of London’s streets, an underground movement was taking the city by storm; the birth of jazz music. The Louis Lester Band is at the forefront of the emerging jazz scene and rise to fame despite being black musicians in a time of racial discrimination. The sensational new musicians are treated to a world of decadence they have never known before. Requested in the arena of the most stylist and fashionable clubs of the era... as long as they remember to enter and exit via the back door. These eager entertainers are caught between two worlds; on the one hand being honoured by the elusive invitation to perform at venues in the company of high class individuals and royals, whilst the consistent threat of their ‘inferior’ social station lies behind every corner. The sudden success begins to go to their heads they start to become entangled in the shadowy and seductive world of high society, until a tragic murder of one of their band members places them at the top of the suspect list. This dark and unexpected turn of events make Louis and his band members re-consider their life plans as they prepare to sacrifice everything they hold dear in the struggle for survival. This spectacular new period drama, set between 1931 and 1933, transports the viewer to a time where music seems to transcend the divisions of class and race, until fear and hate once again threatens to upset this temporary equilibrium. 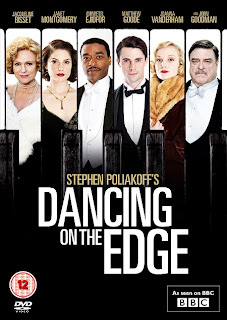 Watch the five-part explosive drama series; DANCING ON THE EDGE as it swings onto DVD on 11 March 2013 from ITV Studios Global Entertainment. Can be purchased from Amazon here.